For the hospitality venues offer hotel-courtesy-laundry bags in two closure types: Draw tape and Tear Tape. Bags are printed with indicated spaces for writing guest name and room number. Gauge: 0.00085. 1000 per case. Elkay Printed Metallocene Ice Bag - 25 lb., .002 ga.
Made from a production process that yields a special balance of ideal ice bag requirements. Beyond what is possible with low or linear low density polyethylene films, these bags excel in high impact strength, low haze/high gloss and clarity, and durabili ty properties. 15" x 30". Tuf-R Linear Low Density Polyethylene (LLDPE) bags provide extra strength and puncture resistance compared to low density bags of the same gauge. Because of this, it's often possible to use a lighter gauge Tuf-R bag to do the job of a heavier gauge LDPE bag, which saves money and helps to reduce the environmental impact. Tuf-R bags are made from virgin materials, so they comply with USDA and FDA requirements for use in food applications. Meet FDA requirements for use in food applications. Bags are from seamless tubing and bottom sealed for extra strength, no side slit seals. Listerine Cool Mint Mouthwash, Gal. Packs a powerful shaving performance into a compact shaver. Corded and cordless use. 30 minute runtime and worldwide voltage compatibility. Flexing rotary heads adjust to contours of your face. Dual track blades. Micro-conditioners to help prevent heat damage and increase shine. Ceramic technology to prevent hair damage while adding faster dry times. Ionic technology reduces frizz and static. 1875 watts, 3 heat settings, 2 speed settings. Cooling button. An ultra close, comfortable shave is easy and convenient thanks to the Remington Smooth + Silky Rechargeable Shaver. Rechargeable with LED indicator. 30-minute run time. Charging stand. Bikini trimmer headguard and cleaning brush. Give your guests the ability to mend their fabrics on the go! Includes 6 different thread colors and multiple needles. 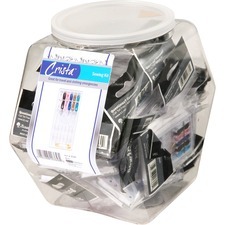 Pamper your guests with this Vanity Box which includes: Nail file, cotton swabs, 2 Q-tips. Disposable paper bathmat is a great choice for hospitality establishments, guest bathrooms, cabins and campers. Unlike fabric bathmats, a disposable mat won't accumulate bacteria and molds that are associated with moist environments. Eliminates need for laundering. Double wrapped paper buckets are a convenient choice in the hospitality industry. Economical option over permanent buckets that require cleaning and replacing. Use for foodservice or as ice buckets. Make everyday shaving a luxurious experience, with a thick, extra rich, creamy lather for a close, comfortable shave. Aloe-rich formula for a smooth shave and soft, moisturized skin. Spreads easily, rinses clean, leaving skin feeling soft and smooth. Stand upright without worry - this latex-free vinyl bathmat has suction cup stabilizers to prevent shifting. Textured surface effectively deflects slippery substances such as soap, shampoo or conditioner. Protects surface from scratches and stains. Easy to clean.